Marking the midway point of the 2010 NASCAR Chase for the Sprint Cup, the premier stock car series enters Charlotte, North Carolina to play a home game for many of the multi-million dollar teams. The Bank of America 500 at the 1.5 mile Charlotte Motor Speedway presents a Saturday night racing backdrop for the NASCAR Sprint Cup series. Sitting on pole for the first time since fall Texas Motor Speedway event in 2009, the Jeff Gordon #24 Dupont Chevrolet led the field to the start line. As Gordon preserved has lead for the initial green flag laps, caution flew shortly with only 3 laps being completed. Sailing through turn 3 and 4 high, the #39 Chevrolet of Ryan Newman experienced a loss of traction. Backing into the outer wall, considerable damage was done to the right rear bodywork of the Stewart/Haas Racing-owned #39 Chevy. Requiring an extended stay in the Charlotte garage, Newman would return to finish 36th through a long night. With Ryan Newman's troubles, the Stewart/Haas Racing boss Tony Stewart's #14 car was also not immune to punishment during the Bank of America 500. In avoiding the Newman lap 3 incident, Stewart's Old Spice Chevy also sustained rear damage. As the race progressed, Tony Stewart encountered miscues entering his pit stall. When entering to attention of his pit crew on lap 26, Stewart needed to take evasive action to avoid contact with the #99 Ford of Carl Edwards which was exiting pit road. Overshooting his team's pit area, Tony Stewart was forced to wait until the coast was clear to reverse and enter his pit. With all the complications of the race, Stewart was left with only a 21st place finish to follow-up his win at California's Auto Club Speedway. Kurt Busch's troubles were the reason for the second caution at lap 25. The winner of the Sprint All-Star and the Coca-Cola 600 races during late May, Busch and his #2 Dodge spun sideways through turn 4. Fighting a loose race car early left Busch and his Penske Racing team struggling in 30th place. While one Busch brother faced a difficult Saturday night at Charlotte, the younger brother and Joe Gibbs Racing driver Kyle Busch provided a lingering presence at the front of the field throughout the Bank of America 500. Leading 109 of the race's first 127 laps, Busch's #18 Toyota shot to a multiple car-length interval on almost every restart. In the only multi-car incident of the Bank of America 500, the #9 Ford of Kasey Kahne unsuccessfully fought a loose exit off turn 4 creating a lap 125 caution. Making contact with the #77 Dodge of Sam Hornish Jr, both cars sustained damage to render them out of competition. While the Richard Petty Motorsports crew was able to repair the #9 Budweiser Ford in order to complete more laps, the car by J.J. Yelley instead of Kasey Kahne. While Kahne explained that he was feeling to ill to continue driving for the night, there has been some rumours that Kahne simply left the #9 Ford team after the crash at Charlotte. Going to Red Bull Racing for 2011 with a Hendrick Motorsports ride waiting for him in 2012, some questions Kasey Kahne's dedication to his current race team. It was reported that Kasey Kahne, having left the race track with illness a matter of 8-10 hours prior, ran a 5k charity marathon Sunday morning. Kurt Busch was not the only driver left struggling within the Chase following a difficult result. 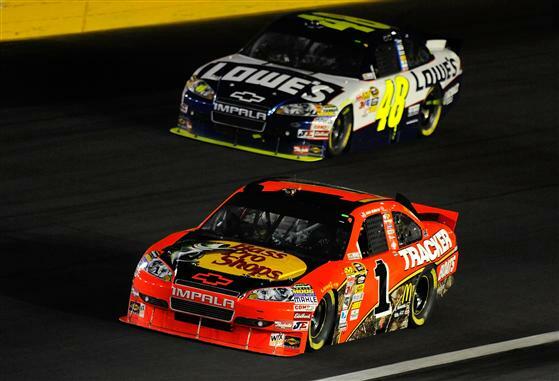 Having led the first 7 laps of the Charlotte night race, pole sitter Jeff Gordon would be robbed from contention of the Bank of America 500. An electrical fault within the #24 Dupont Chevrolet presented itself dramatically during the race when the Hendrick Motorsports car of Gordon appeared to have lost power momentarily on the race track while running as a front runner. Losing positions initially with the brief engine power failure, Gordon's #24 car would continue to the distance but will finish one lap down in 23rd place. For a race that contained 27 lead changes amongst 19 leaders, the Bank of America 500 at Charlotte Motor Speedway was decided on a lap 313 restart following the race's final caution for debris. Gaining ground from a brilliant pit stop from the Earnhardt/Ganassi Racing crew, 27th place starting #1 Chevrolet piloted by Jamie McMurray surged forward all night to an inside front row start on the final journey to green with Kyle Busch on the outside. Showing superiority all race long during restarts, this particular coming to green saw the #1 Chevrolet of McMurray shoot to command the top position. As the final 31 laps ticked away, Jamie McMurray took the checkered flag more than 1.8 seconds ahead of 2nd place Busch. 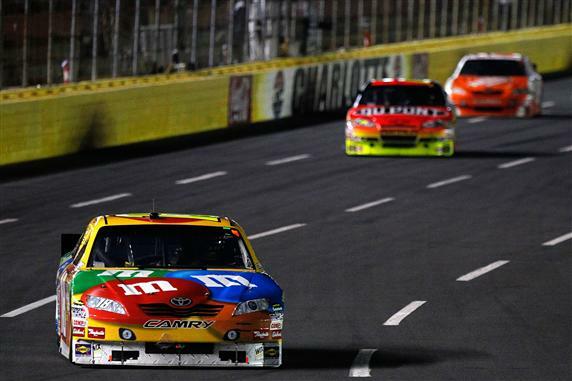 Recovering with a front-running performance and finish at Charlotte following the past two races being marred with disappointing results, Kyle Busch plays to win and left the race car largely unsatisfied by missing victory lane. Charlotte Motor Speedway continues to be a track the younger Busch brother had never reigned supreme after a NASCAR Sprint Cup event. Jimmie Johnson recovered from a lap 35 spin on the backstretch to finish 3rd in a repeat of his result at Auto Club Speedway last race. Running in the lower 20s after his #48 Chevrolet looped around uninjured, Johnson and the Hendrick Motorsports regained their track position by staying out during a caution where leaders pitted. Continuing to show the right stuff for a run at a 5th straight Sprint Cup title, Jimmie Johnson was able to squeak out an additional 5 points over Denny Hamlin. Now 41 points behind after the Bank of America 500, Hamlin's 4th place finish affirms that the #11 Toyota is still in prime pouncing position as the series enters wild card races through the 2nd half of the Chase. The top-10 of the Charlotte Motor Speedway night race allowed the squads of Joe Gibbs Racing and Roush-Fenway Racing an moment of atonement after misfortunes at California. With Kyle Busch and Denny Hamlin scoring top-5 finishes, sophomore driver of the team's #20 Toyota posted a 7th place result for a collectively encouraging night for the Toyota's lead NASCAR Sprint Cup team. Roush-Fenway Racing was led by a 5th place-finishing Greg Biffle as all four of their team's cars finished inside the top-12 which included David Ragan in 10th. NASCAR Sprint Cup drivers and teams will next plan for running Martinsville Speedway (2010 Sprint Cup season's last race on track smaller than one-mile). Jimmie Johnson has won 5 of the past 11 races held on the 0.526 mile short oval but Denny Hamlin has won the past two Sprint Cup events at Martinsville.